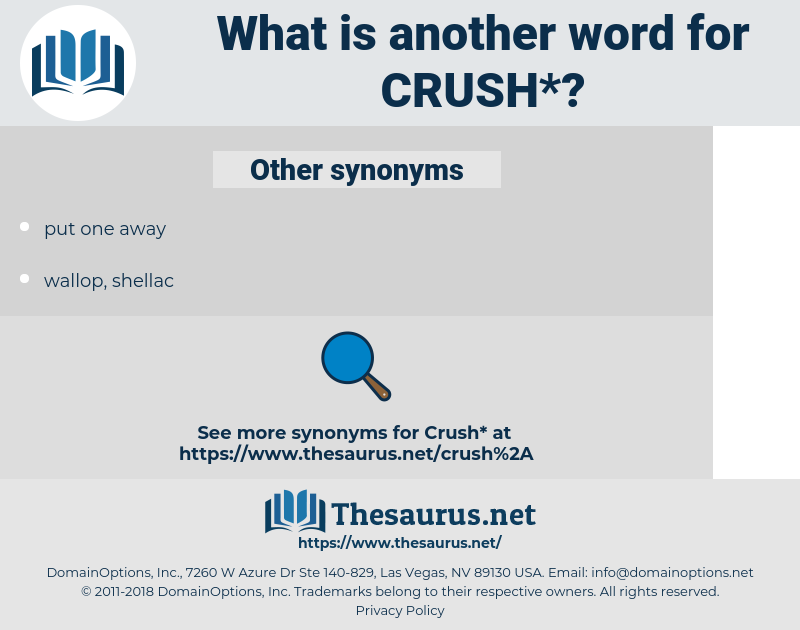 What is another word for crush? To be pressed out of shape or into smaller compass; as, the dresses have crushed. quash, repress, suffocate, demolish, quell, curb, stifle, eradicate, eliminate, Eliminating, oppress, dash, wreck, strangle, punish, uproot, ruin, kill, undermine, defeat, frustrate, extinguish, screwover, stamp, HIT, beat. 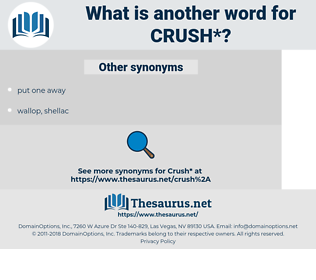 infatuation, rush, stampede, smashing, fling. smash, destroy, suppress, squash, annihilate, overwhelm, squish, shatter, smother, trample, grind, dismantle, obliterate, pummel, crack, mash, squeeze, nip, choke. bind, secure, weld, attach, join, fasten, mend, solder, unite. encourage, lose, smooth, put together, build up, let go, inspirit, compliment, release, Unwrinkle, uncompress, praise, pull, yield, surrender. build, repair, construct, help, create, start, aid.
" Of course," the lawyer continued, " this will all be new to you, but during the last few years Englishmen have become divided into two classes - the people who believe that the Germans wish to go to war and crush us, and those who don't." Upon his head heaven should fall and crush him, and he should be for ever subject to all the dark powers under the earth. cirrhosis, crex, crouch, church key, curiosa, creese, carsick, carica, checkers, carex, crash, characeae, cirque, cercis, courage, chirk, corsica, corixa, crock, circus, ceras, carriage, curacy, ceraceous, corokia, coriaceous, cruse, cork, carissa, circaea, caruso, corky, cruise, CCRC, cirrhus, carioca, cockroach, correggio, Cyrus Ii, creak, crosse, choragic, couch grass, courageous, curious, crosscheck, cargo, crook, crazy house, caries, craze, crake, circe, corsage, charge, carcass, cark, caricaceae, carrizo, Cheshire Cheese, choric, chirico, crick, crag, cress, crus, course, crookes, croak, crisis, curry sauce, carrack, creashak, curacao, croesus, craggy, choragus, crosswise, craigie, cuirass, Cashier's Cheque, casuarius, cherish, cork oak, cirrus, carjack, creaky, car race, coracias, corkage, cereus, crazy, cracow, crass, carcajou, creek, coarse, creche, cow shark, cross-check, cerous, coach horse, crius, crack, cyrus, coerce, carious, crossjack, curassow, Caroche, chorizo, crossway, crux, crax, carriageway, cockhorse, carriage house, cross-eye, currish, corgi, ceres, cashier's check, croaky, casework, ceric, corozo, carcase, Ceruse, crecy, crossways, corse, caress, carack, curse, cross, cherokee, coryza, crocus, curacoa, church, crouse, cerise, carouse, caracas, crease, carassius, chorus. reduce, repress, keep down, subdue, subjugate, quash. come apart, fragmentize, break up, break, fragment, fall apart, fragmentise, separate, split up. abase, chagrin, humiliate, humble, mortify.